I snore. I snore so loudly that it keeps Tawn awake. After trying various remedies such as weight loss and sleeping on my side, I decided to visit an Ear,Nose, and Throat specialist at Bangkok Hospital. After sticking a probe up my nostrils to inspect that things were roughly in order, he suggested I come in for an overnight sleep test. The purpose of the test is to get an accurate read on the quality of your sleep including your sleep patterns, physical movement, brain activity, and breathing. Sleep apnea is a condition often associated with snoring. You stop breathing for extended periods of time (more than ten seconds), which can lead to many health problems including irritability, fatigue, and high blood pressure. I arrived on a Thursday evening at the hospital. After having my vital signs taken, I went for a pair of chest x-rays. (I have to say, before coming to Thailand, I had never had an x-ray in my life. In the six years since, I’ve had close to a dozen. They really like their x-rays here.) Then I headed upstairs to the sleep clinic. My room for the evening resembled a regular hotel room, but with linoleum floors and bedside equipment that reminded you that this was a hospital. The room was also outfitted with two cameras, one of which was infrared, that would allow the sleep technician to observe me throughout the night. After changing into my hospital scrubs, the sleep technician started wiring me up. This took about thirty minutes and my recurring thought was that this must be roughly what a condemned man goes through leading up to his execution. Grim, no? Electrodes were attached to various parts of my body. Having a shaved head made this process easier, I think. A tube was inserted into my nostrils. Straps around my belly and chest held wires and monitors in place. Finally, all the wires were pulled together like a ponytail and wrapped with medical tape. When it was time to go to bed, I had to carefully position myself on the mattress. The technician stretched the wires across the bed to a trio of small devices, which then fed the data directly to the computers in his hidden control room. After saying goodnight to Tawn, I read for a little while until sleepy, finally turning out the light and shutting my eyes. 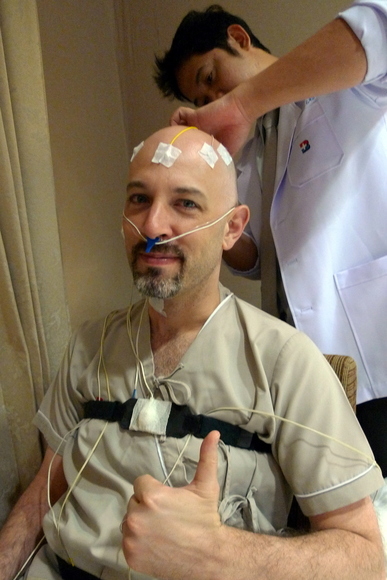 Once the thoughts of imminent execution left my mind, I kept repeating the question, “How can this really measure anything useful?” With this number of wires, electrodes, and monitors, my range of motion was limited. Add to that the unfamiliar bed and pillow and the fact that I usually fall asleep on my side before rolling over onto my back, and I was carrying more negative, skeptical thoughts than usual. I had been offered a mild sedative if I thought I would be unable to sleep, but declined it. After not too many minutes, however, I did manage to drift off to dream land. Sometime in the middle of the night, I awoke for about thirty minutes. I was thirsty and had to stretch awkwardly to reach a bottle of water on the bedstand. Instead of fully quenching my thirst, I merely sipped because if I subsequently needed to use the toilet, I would need to call the technician and be unplugged first. I slept a restless few more hours before finally waking at 5:30. It didn’t take long before I decided that I had had enough of this experience and wanted to get up. I was surprised when the technician, perhaps reading my brain waves, entered the room about fifteen minutes after waking to unwire me without me having to ring for him. Afterwards, I showered and changed into my street clothes, letting the nurse know I would skip the included breakfast and was ready to be discharged. By 6:30 I was home, taking care not to wake up Tawn who was enjoying a peaceful, snore-free night. A few days later I returned to the hospital for my follow-up meeting. While I didn’t feel like my night had produced a representative sample of my sleeping habits, the doctor was confident of the test results. He explained that I suffer from a condition known as “regular snoring” and that I have no sleep apnea. All of the measures – blood oxygen, brain waves, sleep modes, etc. – we within a normal range. Whether I do anything further to treat the snoring is up to me, but it is posing no health risks at this point. In retrospect, I have to give the Bangkok Hospital staff high marks for professionalism and attentive service. While I think the package might be a little steep at about US$500 (Why do they need to x-ray me, for example?) the experience was a positive one. My doubts about the effectiveness of the test may linger, just slightly, but at least I know that my health is in no immediate danger. This entry was posted in Uncategorized and tagged Apnea, Bangkok, health, Hospital, Medical, Sleep, Snore, Snoring, Test, Thailand by christao408. Bookmark the permalink. Glad it was nothing serious but I, too, think it was a little pricey. There a section of the hospital here devoted to sleep problems. Seems like it’s quite pricey spending 15,000 baht on a “research” project. I wonder why some couples I know of sleep in separate rooms. Snoring issue, I suppose! I snore too and sometimes it’s loud enough to wake me up. I’m glad they didn’t find anything wrong with you. “Don’t be scared of me and my wires.” That would make a great movie line hahaI thoroughly enjoyed watching the video. Great editing and style to it! Very intriguing seeing how this all works. You’re awful brave to be poked and prodded like that. But I wish you the best results anyway. They have all sorts of anti snoring aids. I suppose Tawn is motivated to investigate more on that subject.Sleep apnea is not a cure for snoring. My neighbor wears a mask and now can sleep the whole night without waking up and being sleepy during the day. Sleep apnea is associated with being slightly obese.Another wonderful post, hopefully you will find the holy grail of not snoring. I do find that when I am terribly tired I do snore more than normal. I like the bits of humor in this post despite what this is all about. And I’m glad it’s nothing serious. I wonder what you’ll do next about this, if you’re planning on doing anything else for that matter. 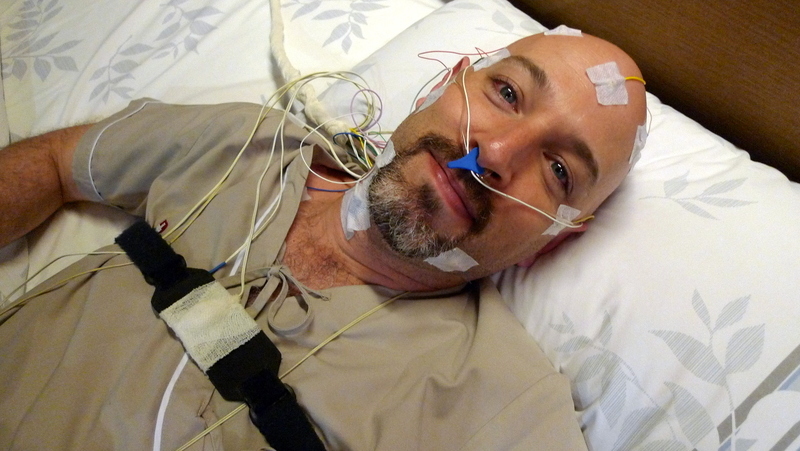 I used to visit the sleep center in the hospital where I worked at to perform IT service. Very interesting stuff. There was one office where they would trim your uvula and other tissue with a laser so it wouldn’t vibrate so much when sleeping. I think I would have better luck if my jaw could jut forward more, opening the back of my mouth more. I agree that it’s easy to be skeptical about conclusions drawn from a test that itself causes such an atypical night of sleep, yet it’s interesting that doctors seem to get the data they need from bouts of sleep nonetheless. Glad to hear that you are just a regular snorer! hehe! Interesting experience! Another great account. It does seem very uncomfortable. I am actually surprised that you slept a wink! At least it is good to know you do not have sleep apnea. Went through the same ordeal about ten years ago and have had to use a “C-pap” system ever since. Sleep better, but still have bad dreams about the IRS. Great post!!! Have you tried that machine that shoves air down your throat? My dad started to use that and his snoring has stopped. @Roadlesstaken – Thanks for the rec, Alex. Someone will have to work that line into a script one of these days. Feel free to use it! @LostSock21 – I’m familiar with the positive-pressure machine but the hassle of having to carry a machine with you when you travel, plus the noise the machine makes and its expense, making it an unattractive option for me. @UncCharlie – Glad you enjoyed the post. So you’ve had a good experience with the CPAP? As I mentioned to Jonathan in the previous post, I’m disinclined to use the machine for a variety of reasons. @epiginoskete – @awoolham – Yes, the wonders of science – they can get the data no matter what! We’ll see whether it proves to be accurate. @CurryPuffy – My great-grandparents slept in separate bedrooms for decades. Probably what contributed to their marriage lasting more than six decades! Unfortunately, we have a pretty small condo! @catstemplar2 – @nov_way – @Ricardo98 – There is a newer procedure called radiofrequency ablation that seems to be very effective and minimally invasive. In it they use high frequency radio waves to damage the soft palate on the roof of your mouth. As it heals, scar tissue form, firming up the palate and significantly reducing vibration (and, thus, noise) when breathing. It takes about twenty minutes to do and the effects are similar to a sore throat, lasting three days or so. I may do this in the near future. @PPhilip – Many thanks for the recommendation. I’m weighing my options but may go for a procedure called Radiofrequency Ablation. Will write about it if I do. @murisopsis – @Fatcat723 – @ElusiveWords – Glad you enjoyed the entry. I’m happy that it isn’t anything more serious than basic snoring, but would like to find a way to minimize the problem nonetheless. @armnatmom – @fauquet – The things I’ll do to get an interesting blog entry for my readers! Ha ha! Thanks for your comments. It’s good that your results came out in such a positive manner. I have a friend that had to undergo surgery because his snoring was getting so bad. We used to have to place him in a separate room! you look scary with all those wires on you. as if you’re under a treatment for a fatal disease. thank goodness you’re not. 🙂 My son had to sleep with that horrible bi-pap machine 2 months before he got a Child sleep test last year. it took so long to get a child in to the test since they were backed up. We were relieved he didn’t need the machine after that. You are kind of lucky in that because the machines are so uncomfortable said my son and now my husband has one of those C-pap machines. He hates it.So count those lucky sleep sheep and snore with contentment. 🙂 ha-ha! I’ve done those tests a couple of times. I have “mild” sleep apnea meaning I only stop breathing about 20 times a night… Glad you don’t have anything too serious! @mizz_chan – I don’t want to get to that point where, if I stay with friends, I’m banished to some room far away from everyone else because of my snoring! @rudyhou – Yes, thank goodness. Glad you like the picture, though. @oxyGENE_08 – Might be time to go in for a test, then. @brooklyn2028 – Mild sleep apnea can still cause health problems, can’t it? Make sure you don’t let that happen! @Ikwa – Actually, I’m going to go in this week and have a procedure done that should reduce (if not eliminate) the snoring. It can be a strain on a marriage to have a partner not be able to get a full night’s sleep because of snoring… and I don’t want to be causing that. @nov_way – Many thanks… stay tuned. @Iedul Shabuur Kaiser – Many thanks for your comment and welcome. I’m flattered that you enjoy the site so much. Good thing you don’t have sleep apnea. You wouldn’t ever travel light anymore!